from p.67 of Star Names, Richard Hinckley Allen, 1889. Alpha (α) Carina, Canopus, is a white binary star in the Keel of the ship Argo Navis, the brightest star in the constellation of Argo Navis, the Great Ship, and the second biggest star in the sky; after Sirius which it closely aligns with by longitude (Canopus is now, in 2008, 15Cancer05 and Sirius 14Cancer12, but they are separated by 36 degrees in ecliptic latitude). Canopus is not visible to anyone living above latitude 37 degrees north of the northern hemisphere. The Greeks called it Kanobos, and Kanopus, transcribed into Canobus and now it universally is Canopus. The Greek astronomer Aratus, circa 270 B.C., Eudoxos, and Hipparchos also, designated it as Pedalion; the Rudder, and Cicero's Gubernaculum. The foregoing derivation of the word Canopus is an early and popular one; but another, perhaps as old, and more probable, being on the authority of Aristides, is from the Coptic people of Egypt, or Egyptian, Kahi Nub, Golden Earth. Ideler, coinciding in this, claimed these words as also the source of other titles for Canopus, the Arabic Wazn, Weight, and Hadar, Ground; and of the occasional later Ponderosus and Terrestris. Although I find no reason assigned for the appropriateness of these names, it is easy to infer that they may come from the magnitude of the star and its nearness to the horizon; this last certainly made it the (Greek) perigelos (perigee) of Eratosthenes. Similarly the universal Arabic title was Suhail, written by Western nations Suhel, Suhil, Suhilon, Sohayl, Sohel, Sohil, and Soheil, Sahil, Sihel, and Sihil; all taken, according to Buttmann, from Al Sahl, the Plain. Suhel ponderosus, Subhel. This word also was a personal title in Arabia, and, Delitzsch says, the symbol of what is brilliant, glorious, and beautiful, and even now among the nomads is thus applied to a handsome person. Among the Persians Suhail is a synonym of wisdom, seen in the well-known Al Anwar i Suhaili, the "Lights of Canopus". The seventeenth century French astronomer Bullialdus in his Astronomia Philolaica, it was transcribed Soail Iamane (Yamane). This was from the Arabs' Al Suhail al Yamaniyyah, the Suhail of the South, or perhaps an allusion to the old story, told in connection with our Procyon, that Suhail (Canopus), formerly located near Orion's stars, the feminine Al Jauzah, had to flee to the south after his marriage to her, where he still remains. Others said that Suhail (Canopus) only went a-wooing of Al Jauzah (Orion), who not only refused him, but very unceremoniously kicked him to the southern heavens. Another occasional early title was Al Fahl, the Camel Stallion. Allusions to it in every age indicate that everywhere it was an important star, especially on the Desert. There it was a great favorite, giving rise to many of the proverbs of the Arabs, their stories and superstitions, and supposed to impart the much prized color to their precious stones, and immunity from disease. Its heliacal rising, even now used in computing their year, ripened their fruits, ended the hot term of the summer, and set the time for the weaning of their young camels. "The Star of Egypt, whose proud light, Never hath beam'd on those who rest In the White Islands of the West;"
again alluding to it, in the same poem, as the cause of the unfailing cheerfulness of the Zingians (the inhabitants of Zinge, a large village forty miles northeast of Mosul, in Kurdistan). And, as the constellation (Argo Navis) was associated on the Nile with the great god Osiris, so its great star became the Star of Osiris; but, later on, Capella and the scholiast on Germanicus called it Ptolemaeon and Ptolemaeus, in honor of Egypt's great king Ptolemy Lagos; and at times it has been Subilon, but the appropriateness of this I have been unable to verify. The (Greek) Sampilos, cited by the 17th century English orientalist Thomas Hyde as from Kircher, and so presumably Coptic people of Egypt, is equally unintelligible. While all this knowledge of Canopus is ancient, it seems "but of yesterday" when we consider the star's history in worship on the Nile. Lockyer tells us of a series of temples at Edfu, Philae, Amada, and Semneh, so oriented at their erection, 6400 B.C., as to show Canopus heralding the sunrise at the autumnal equinox, when it was known as the symbol of Khons, or Khonsu, the first southern star-god; and of other similar temples later. At least two of the great structures at Karnak, of 2100 and 1700 B.C., respectively, pointed to its setting; as did another at Naga, and the temple of Khons at Thebes, built by Rameses III about 1300 B.C., afterwards restored and [p.71] enlarged under the Ptolemies. It thus probably was the prominent object in the religion of Southern Egypt, where it represented the god of the waters. The Hindus called it Agastya, one of their Rishis, or inspired sages,— and helmsman of their Argha,— a son of Varuna, the goddess of the waters; and Sanskrit literature has many allusions to its heliacal rising in connection with certain religious ceremonies. In the Avesta it is mentioned as "pushing the waters forward"—governing the tides(?). In China it was Laou Jin, the Old Man, and an object of worship down to at least 100 B.C. Since the 6th century it has been the Star of Saint Catharine, appearing to the Greek and Russian pilgrim devotees as they approached her convent and shrine at Sinai, on their way from Gaza, their landing-place. In early German astronomical books it was the Schif-stern, or Ship-star. "those three torches, With which this hither pole is all on fire." Hipparchos was wont to observe it from Rhodes in latitude 36° 30'; and, even before him, Posidonius of Alexandria, about the middle of the 3d century before Christ, utilized it in his attempt to measure a degree on the earth's surface on the line between that city and Rhodes, making his [p.72] observations from the old watch-tower of Eudoxos at Cnidos in the Asian Caria,— possibly the earliest attempt at geodetic measurement, as this observatory was the first one mentioned in classical days. Manilius poetically followed in his path by using it, with the Bear (Ursa Major), to prove the sphericity of the earth. No myths or astrological interpretations are associated with the constellation Carina because this constellation had always been seen as part of the constellation Argo Navis, the Great Ship, until French astronomer Nicolas Louis de Lacaille in 1752 subdivided Argo Navis into Carina (the keel of the ship), Puppis (the poop), and Vela (the sails), plus a subordinate division of Argo now called Pyxis Nautica. 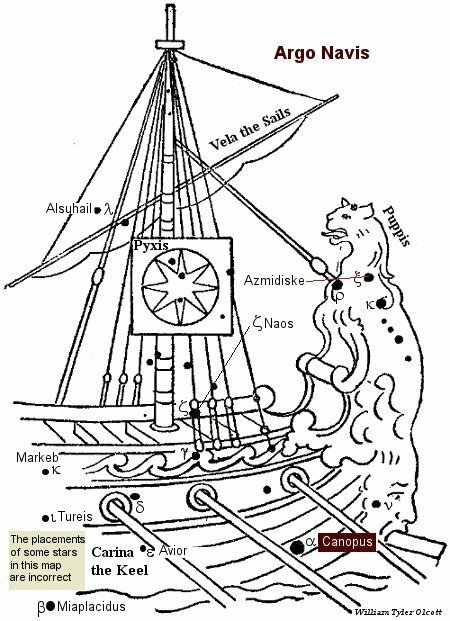 The constellation Argo Navis represents the ship in which Jason brought the Golden Fleece from Colchis, said to be the first ship ever built.